Emerson Keith and Paul Ulibarri share the early clubhouse lead after the first crack of Disc Side of Heaven. The two have a one stroke lead over the field after shooting 1073-rated, 12-under par 52s. Keith was driven by a strong 8-under on the front nine and his 100% scramble rate kept him bogey-free on the round. The only hole Keith missed on the front nine was hole 2, which only four players in the Open division were able to get. He was third in fairway hits at 89%, second in Circle 1 in regulation at 61%, and fourth in Circle 2 in regulation at 78%. Keith added three putts from C2 in his round. 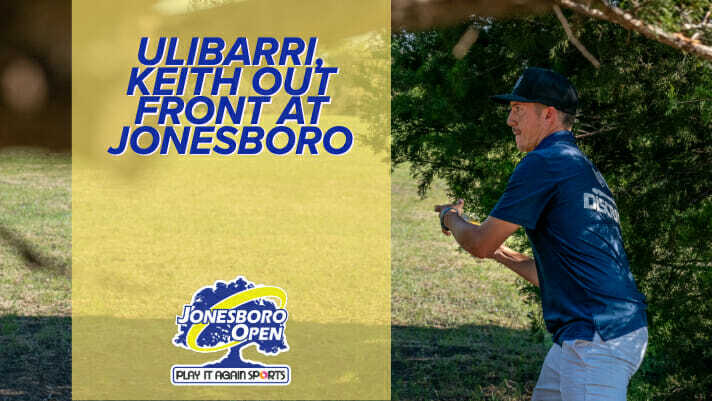 Ulibarri’s heroic drop-in birdie on hole 18, the toughest hole to par on the round, tied him with Keith. Earlier in the day, Uli strung together seven straight birdies from hole 4 to 10, and also finished bogey-free. He was 100% from Circle 1 putting, and also added six C2 putts for good measure. Garrett Gurthie and Kevin Jones are tied in third, one stroke back at 11-under par 53. KJUSA was bogey-free with an eagle, and GG tied Keith and Ulibarri for the birdie lead but carded one bogey. Both Gurthie and Jones were playing on the live feature card. Simon Lizotte and Paul McBeth are tied for fifth at 10-under par 54. Will Schusterick played well in his first Disc Golf Pro Tour event of the season, finishing with a 2-under par 62 in a tie for 41st along with other top touring players including Calvin Heimburg, who had a disastrous front nine, Cale Leiviska, and Zach Melton. The course played about two strokes closer to par than last year’s opening round (-0.19 vs. -2.26) with 19 more players in the field. Gurthie shot the hot opener in 2018, a 14-under par 50. Touring partners Reid Frescura and Andrew Marwede are tied in 12th and both had a throw-in. We just thought that was a fun stat. Comments on "Ulibarri, Keith Shoot Hot Round To Lead Jonesboro"